Stock footage of artwork integrated in a headstone made of sandstone. 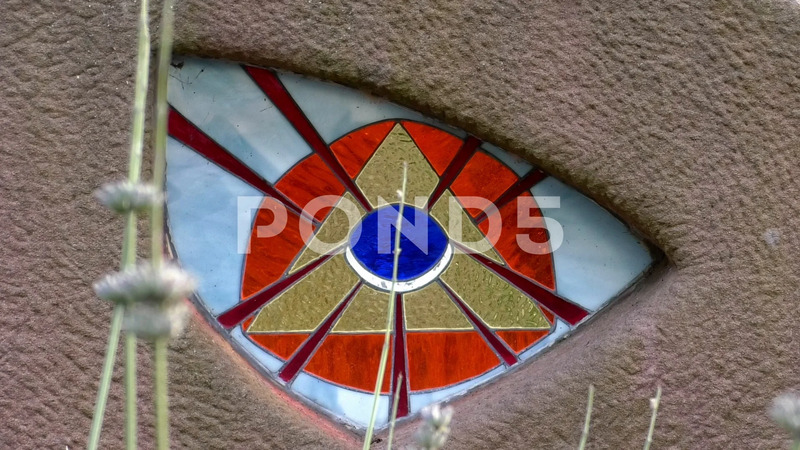 The artwork is made of colored Tiffany glass and depicts a religious symbol known as the "Eye of Providence" or the "all-seeing eye of God". Plants are growing in the foreground. Background info: In Christian mythology, the symbol of the eye surrounded by rays of light and enclosed by a triangle is meant to represent the concept of Divine Providence, an expression of the belief that mankind is under God’s sovereign guidance and control. Variations of the symbol are also associated with freemasonry and similar mystic orders and usually symbolize the belief in a higher entity that observes the thoughts and undertakings of mankind.